“I once sat next to a man at a wedding who told me he had been schooled at Cheltenham College. Towards the end of his time there he was taken to Christ College Cambridge – and that is exactly where he ended up. My experience of schooling was quite different, I received a harsh, poor education at a Church of England school, then on to a comprehensive where I languished in the bottom streams. When it came to my time to leave I was taken on a trip to Albany Laundry … … No – I didn’t end up there! But the differences between the man at the wedding and me were stark. Was he brilliant? Maybe. Was I stupid – well, maybe! At 16, I started work at Royal London Insurance and worked with Joan, a woman committed to adult education. She gave me the encouragement needed to register for some adult education subjects – gaining GCSEs, 3 A-levels and an Open University degree, a 2.1 I might add. • Julie is a prominent Colchester Borough and Essex County Councillor who is well known for her community-orientated approach. She is about to complete a highly successful year as Mayor of Colchester. 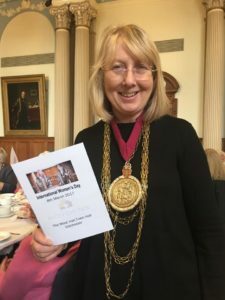 She told us her story following an International Womens’ Day event at the Town Hall, raising funds for local charities.